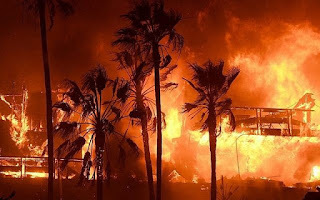 The fires racing through southern California have led to the evacuation of more than 260,000 people, burned over 83,000 acres and destroyed more than 170 homes, as well as damaged several Jewish institutions. At the Ilan Ramon Day School in Agoura, California, the school’s computer lab, administration building and a bathroom were destroyed by fire. The school launched a GoFundMe page on Friday titled “Help Rebuild Ilan Ramon Day School,” with a goal of $750,000. The fire also reached the Shalom Institute, a camp and conference center located in the mountains of Malibu. In a message sent on Saturday, the heads of the institute in a letter said that the fire had caused damage to the facility, but it was not yet known how serious. The staff, animals and Torah scrolls located on the campus of the institute were safely evacuated on Friday, according to the message signed by Gil Breakman, president, and Rabbi Bill Kaplan, executive director, of the Shalom Institute and Joel Charnick, director of Camp JCA Shalom. Camp Hess Kramer, a camp owned by the Wilshire Boulevard Temple, said in a message to camp families that “at least some structures” at the camp were consumed by the fire. The camp’s Torah scrolls were evacuated ahead of the fire, and the camp is fully insured, according to the message. “Our thoughts and prayers are with all the first responders working so hard to protect life and property and to those who are suffering. May we begin a new week with them and each other in our prayers,” read the message, posted on Facebook, signed by the synagogue and camp leadership. On Friday, the rabbi and president of Temple Adat Elohim, a Reform synagogue in Thousand Oaks, located in the same neighborhood as the Borderline Bar and Grill, the site of a deadly shooting on Wednesday night, managed to enter the synagogue on Friday and remove its four Torah scrolls as mandatory evacuations were underway. Some 175 families of the Malibu Jewish Center and Synagogue were evacuated from their homes as was the synagogue. On Saturday the synagogue posted on its Facebook page that the building remained unharmed. The synagogue’s Torah scrolls had been removed a day earlier as a precaution to the Kehillat Israel synagogue in Pacific Palisades, which played host to a bar mitzvah that had been scheduled for the the Malibu Jewish center. The family of the bar mitzvah invited the entire congregation to gather at the synagogue and celebrate with them. “I want to assure you that we are doing all we can to help our community as this natural disaster affects our Jewish institutions and homes,” he also wrote. Mandatory evacuation orders were issued on Friday for families and institutions in Calabasas, Malibu and Thousand Oaks. Strong winds were forecast to pick up in the area on Sunday, which combined with little moisture in the air and extremely dry ground from months of drought could cause the fires to continue to spread, according to Accu-Weather.